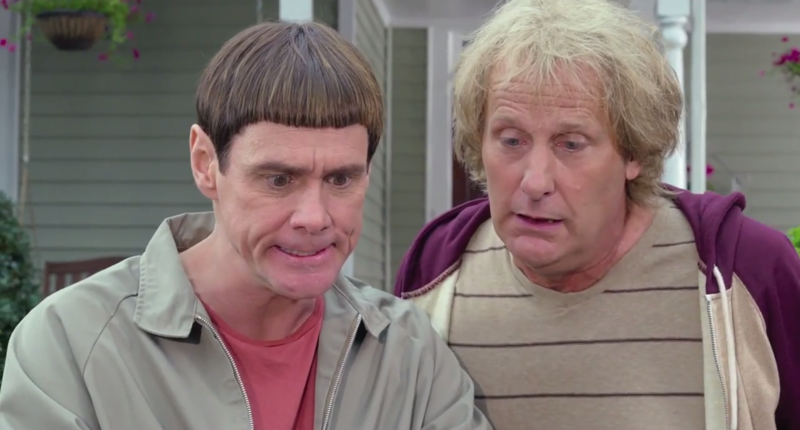 The long-awaited trailer for Dumb and Dumber To premiered on The Tonight Show with Jimmy Fallon Tuesday night and it was... something. It hasn't even been a week since the Dumb and Dumber To movie poster hit the Internet and I'm still trying to decide what kind of something this is. The original film, Dumb and Dumber, premiered in 1994 and two decades later the Farralley Brothers are giving us a sequel that everyone can't stop talking about. Dumb and Dumber followed Lloyd Christmas, played by Jim Carrey, and Harry Dunne, played by Jeff Daniels, as the two dimwitted but kind friends set out on a trip from Rhode Island to Colorado to return a briefcase full of money to its owner while being pursued by a group of criminals who are after the briefcase. The film's low-brow comedy endeared it to fans and '90s children alike, even spawning a one season cartoon spinoff and an unofficial, critically panned prequel called Dumb and Dumberer: When Harry Met Lloyd. Add the fact that this, unlike When Harry Met Lloyd, is directed and endorsed by the Farralley brothers and features the original cast then, at the very least, Dumb and Dumber To has the potential to be the kind of sequel that's so good it's average. Watch the trailer below.